& a simple White Candle. Little snowflakes made of felt. Bleached Bottle Brush Trees & Small Mercury Glass Ornaments. White, Mercury Glass, Lights and More Light. with a Star on top on the other side. is on the Entry Table this year. dressed in a very Whimsical Winter Fashion. and the Natural Bottle Brush Wreath. with lights tucked in behind it. tinsel to hide the stems inside. Just beautiful, Donna! It looks like a Winter Wonderland! Love how you did your mantel and your entry table. Merry Christmas to you and your family! Wat a beautiful post. Merry Christmas!!! Oh my Donna!!!!! It is sooooooo beautiful and festive!!! Love all the white. When I saw the picture of the white wreath it dawned on me that I have a wreath like that but have no idea where it is! I do have about 4 boxes of Christmas that I didn't put up this year so it must be in one of those- makes me want to go digging and find it now!! Not sure if my comment was accepted ~ Blogger is acting up. Will check back later. Everything is absolutely stunning ~ so elegant! 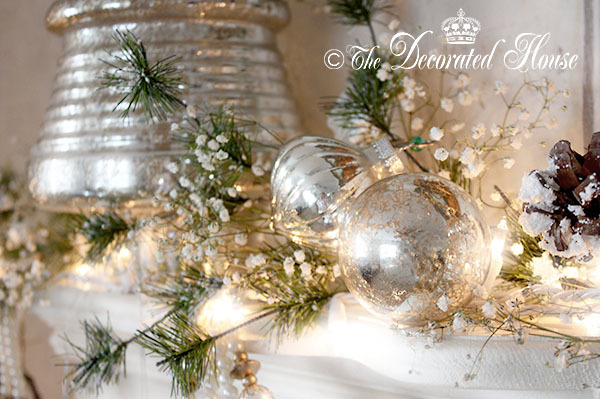 I especially love the angel, crown and mercury glass. Love everything. So gorgeous. May I ask where you purchased your angel? 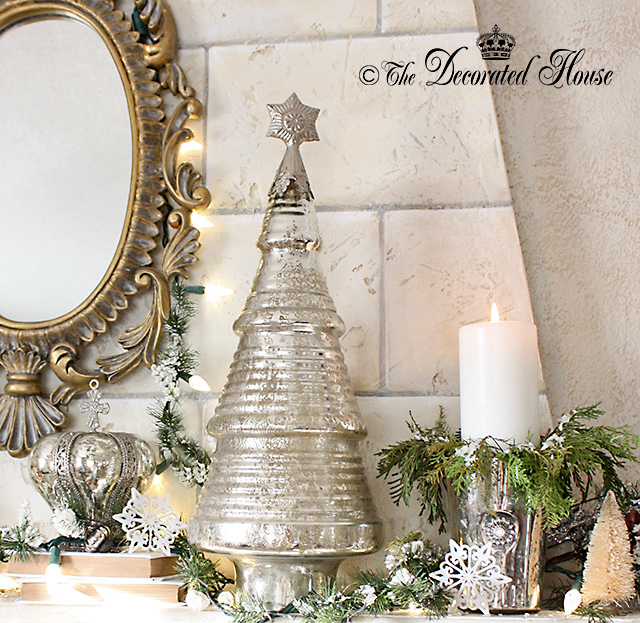 What a gorgeous vignette, Love all the silver and white... elegant!! I never woulda thought to tuck in baby's breath and I love the way it looks with the pine. A bottle brush dog, how darling!! Donna, your decorations are just gorgeous! I wish you and your family a Very Merry Christmas! 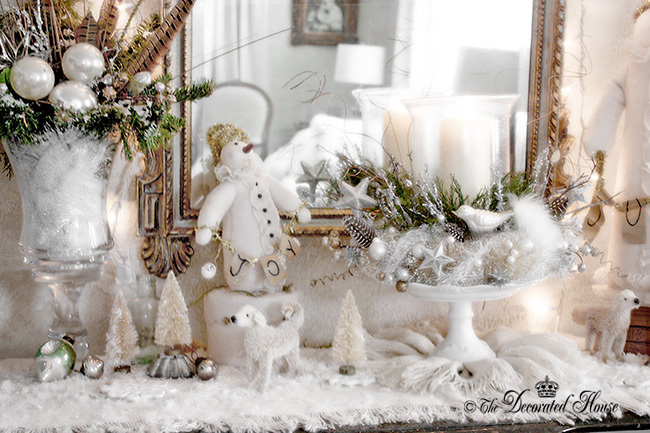 Love your decorations - so "frosty" looking! Thank you Donna for gracing your beauty over at my place, awwww! How beautiful your silver of grey's are and the whites of à Joyeux Noël are over here. Thank you for the beautiful comment left by you about my French théâtre where I create show of holiday. I am going to go back and read more postings to better myself with knowing you. 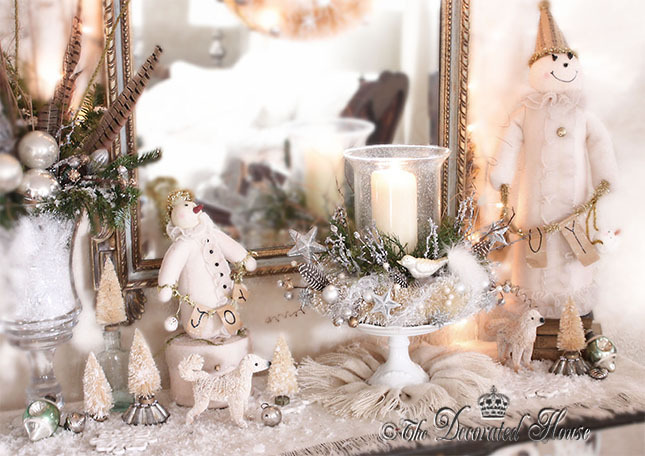 What an elegant Christmas Winter Wonderland decor!!! Merry, Merry Christmas, dear friend! 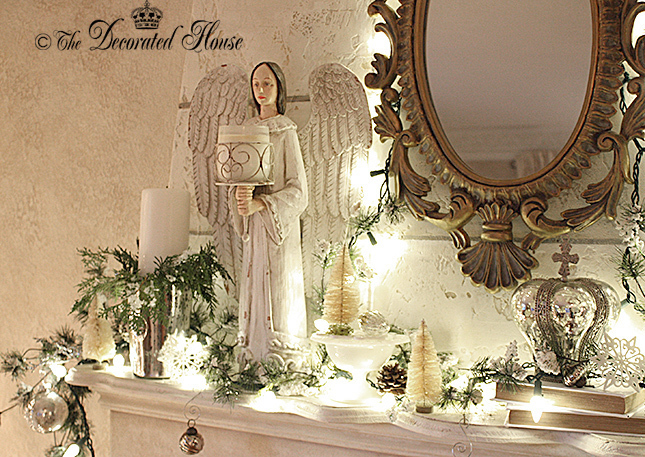 Adore you Decorated House Donna! Especially the little dog!!! So nice. Always a pleasure to see your holiday decor. 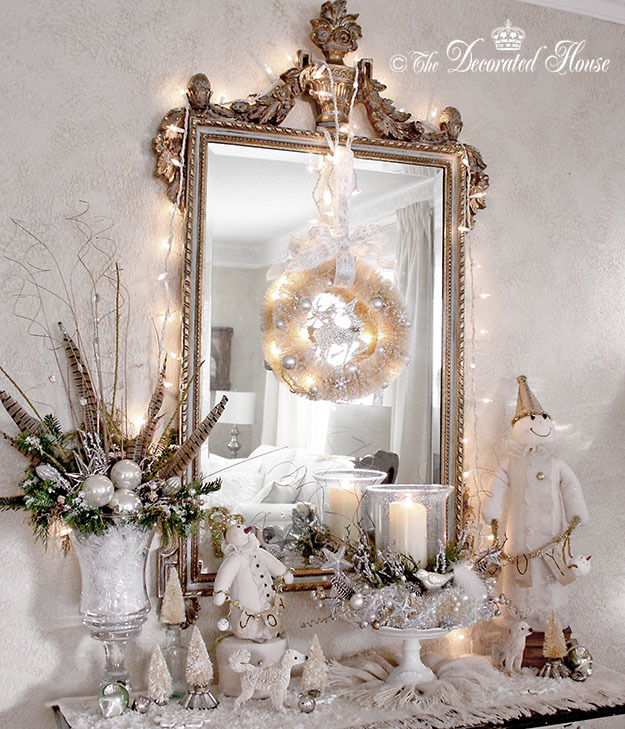 I really like the wreath hanging in front of the mirror. So simple and yet elegant. 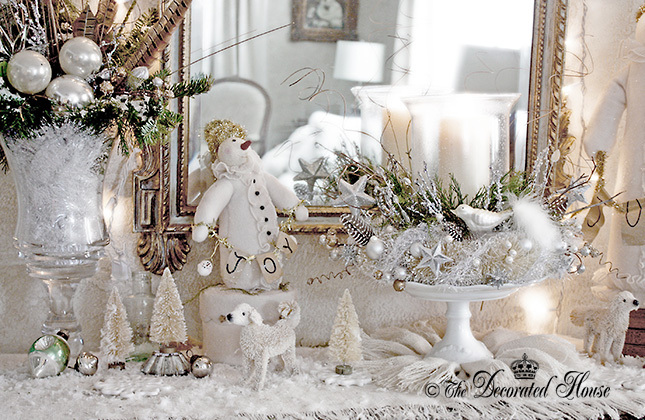 Your Christmas mantel is so beautiful! Love the snow and sparkle!! 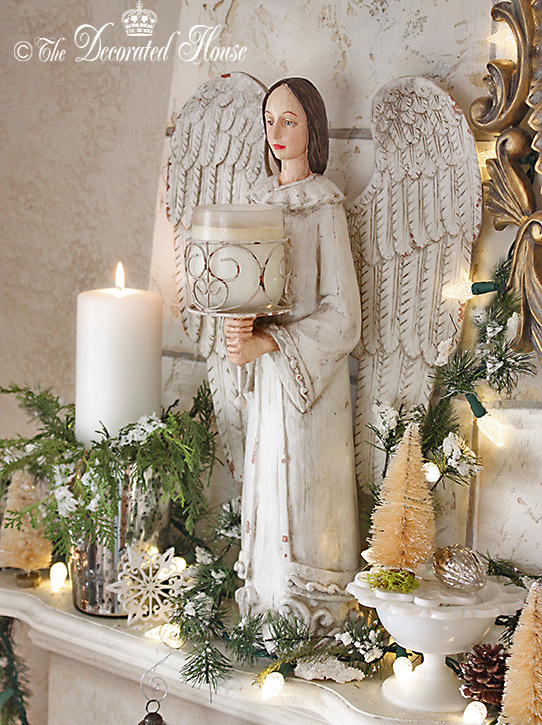 The angel was found several years ago. I tried to find the company, but was unable to.